Nigeria’s story of development is an interesting one, and not sufficiently told or understood outside of Nigeria and Africa more generally. In the 1970s its government pursued the conventional import-substitution industrialisation strategy of that time. The exchange policy adopted favoured a high valuation of the Nigerian naira, deliberately to assist local producers to source foreign inputs cheaply. Similarly, the increasing revenue from oil exports also precipitated this over-valuation of the currency. However, these factors affected adversely agricultural production which had previously been the main revenue source for the economy. So, with the oil price crash in early 1980, Nigeria suffered huge shocks: the depletion of its foreign reserves and the emergence of huge trade deficits. To alleviate these problems, the IMF and the World Bank proposed neoliberal policies of deregulation and liberalisation. It was argued that subsidisation, which many governments in the developing countries were adopting to boost capital accumulation, was in fact the reason why most of them ran very low surpluses (worsened by low tax revenues), which then in turn generated low government savings to be mobilised by the financial institutions. In similar fashion, it was suggested that the use of ceilings prevented interest rates from playing the role of balancing the supply and demand for money. Since the mid-1980s Nigeria has gradually embraced most, if not all, of the policies contained in the ‘Washington Consensus’. Financial markets have been liberalised, public entities privatised and most trade restrictions removed. However, despite all these efforts, the overall development of the economy and the well-being of the populace have stagnated or deteriorated in some key aspects. 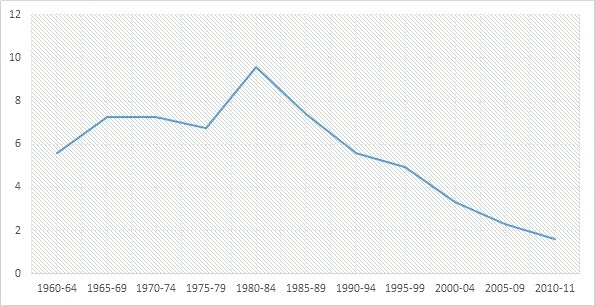 Production from manufacturing has declined tremendously as a proportion of the national output (Figure 1), culminating in the growing number of unemployed persons (rising from 11.9% in 2005 to over 23% in 2011) and the increasing number of vulnerable poor persons (over 60% of the Nigerian people now live below US$1.25 a day). The bane of this persistent underdevelopment in Nigeria can be attributed to the low and unattractive rate of profit accruing to real production in the country. The arguments of The Wealth of Nations, as articulated by Adam Smith, lend sanctity to the pursuit of profit. Famously, according to Smith, it’s not as a result of the benevolence of the butcher, the brewer or the baker that we expect our dinner, but rather from their regard for their own self-interest. This salient factor – personal gain/profit – determines how much capital is committed to a particular productive process, and has often been low and unattractive in Nigeria. J. M. Keynes was also keen to point out that the consideration of the entrepreneur’s own profit is the sole factor that determines how much he employs his capital in any productive process. In essence, when discussing issues that might be inhibiting the growth of real capital accumulation, it is thus logical that this central motivator should at least be considered, especially to assess if it’s sufficient to induce accumulation in a particular process in a given country at a particular time. This is an absolutely key point. The truth is that the probability of making sufficient profit in a real production process in Nigeria, after compensating for the various associated risks, is on average negative (assuming here that all the required capital is borrowed). As a principle, Smith asserted that, if an entrepreneur borrows money and uses it as capital, he expects both to restore the capital and pay the interest without alienating or encroaching upon any other source of revenue. As such, when the profits which can be made by the use of capital are diminished, the price which can be paid for the use of it (the interest rate) must necessarily be diminished with them. Keynes too remarked that the rate of interest on capital should be below the rate of profit accruing from that capital. However, as Table 1 above shows, this has often not been the case for Nigeria. Interest rates have generally been high, with the result that the sober entrepreneur, who will give for the use of money no more than a part of what he or she is likely to make by the use of it, has mostly ventured not to bother borrowing and investing in the country. 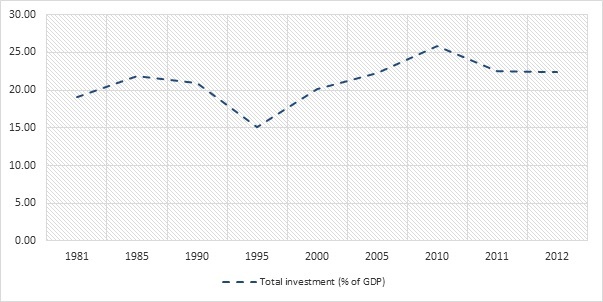 Further drawing on Smith’s view that capitalists tend to employ their capitals in countries where the profits of trade are higher, it should therefore come as no surprise that the level of real investment in Nigeria has stagnated over the years (Figure 2). For many factors conspire to affect, and undermine, the rate of profit attributable to real production in Nigeria. Chief among them are: the uneven competition between Nigerian capital and capital coming from core and semi-peripheral economies; the high internalised external costs, particularly for electricity generation and transportation; ineffective demand for domestic products, exacerbated by the increasing costs of medical care incurred by poor people who have no succour from the government; and, finally, the increasing actual cost of capital, often precipitated by the rising influx of liquid capital and weak enforcement of contracts. In conclusion, the first move that needs to be made to deal with Nigeria’s many contemporary problems of development should be to sweep away these many structural obstacles which decimate the rate of profit accruing to real production. Recommendations or solutions should focus, above all, on alleviating the problems that inhibit real capital assets from reproducing sufficient returns. Nigerian policy-makers should create a ‘congenial’ environment that ensures that the rate of profit accruable to real production is maintained at a level whereby the would-be capitalist deems it satisfactory to invest in a real productive process in the country. Such an environment definitely does not include completely unfettered capital and trade mobility.